Scandal: A new investigation reveals that Bill and Hillary Clinton took in at least $100 million from Middle East leaders. Can such a financially and ethically compromised candidate truly function as our nation’s leader? The investigation by the Daily Caller News Foundation has uncovered a disturbing pattern of the Clintons’ raising money for the Clinton Foundation from regimes that have checkered records on human rights and that aren’t always operating in the best interests of the U.S. By the way, the $100 million we mentioned above doesn’t appear to include another $30 million given to the Clintons by two Mideast-based foundations and four billionaire Saudis. All told, it’s a lot of money. Well, maybe not, given that Clinton, during her four-year tenure as secretary of state, used a clearly illegal private email server which is now under investigation by the FBI. Her open e-mail system likely was hacked by Chinese, Russian and perhaps other spy agencies, say cyberespionage experts. Such negligence would seem to disqualify her from ever holding a sensitive foreign policy post in the government again. Meanwhile, former U.S. Attorney Joseph E. diGenova told the Caller that he believes the FBI has launched a second, possibly more serious investigation into possible political corruption involving the Clinton Foundation. This is potentially explosive, given that the Clintons seem to have run their charity in a way that lines their own pockets. 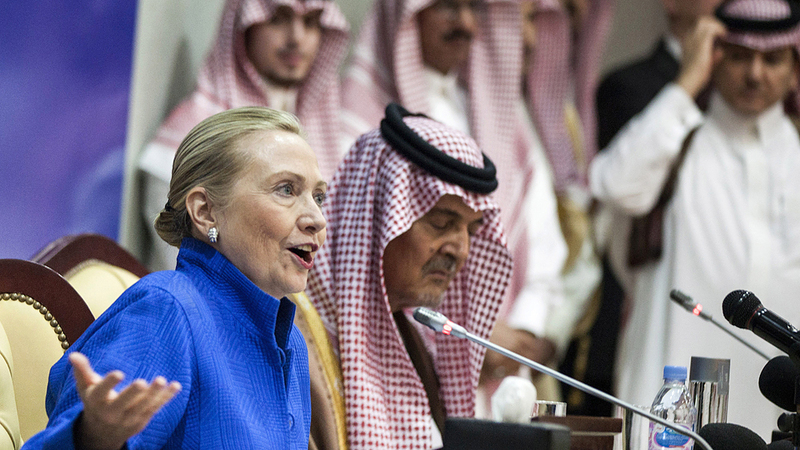 The question is an open one: Did the oil-rich Mideast nations give lavishly to the Clinton Foundation in an effort to influence future U.S. policy? And what about Bill Clinton’s business partnership with Sheikh Mohammed bin Rashid Al Maktoum, Dubai’s authoritarian ruler, from 2003 to 2008? Clinton took away some $15 million in “guaranteed payments” from the deal, his tax records show. A picture of extraordinary greed is emerging from both Clintons in the years after they hold the highest posts in the U.S. government. In just the past three years, after her stint as the nation’s top diplomat, Hillary Clinton spoke to dozens of deep-pocket firms on Wall Street, typically charging $250,000 a pop to hear her wit and wisdom — despite her bitter condemnations of Wall Street during her campaign. All told, she took in an estimated $22 million from these speeches — an extraordinary amount, given the growing consensus among foreign-policy thinkers that Clinton was one of the worst secretaries of state ever. So why would Arab potentates and Wall Street magnates alike pony up so much money for the Clintons? Is it because they believe so strongly in the philanthropic mission of the Clinton Family Foundation? Or is it that they hoped to have influence on a future Hillary Clinton presidency, which would of course feature First Gentleman Bill Clinton? Remember, a Hillary Clinton presidency once looked like a sure thing. Now, given the growing possibility that she could be charged for criminal negligence for putting secret material on a private server, or perhaps even be charged with corruption, Clinton has far more serious problems than just getting elected. Her biggest problem may be staying out of prison.